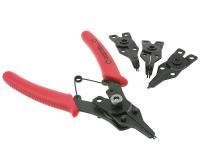 Circlip pliers with 4 interchangeable bits. Allows you to work on circlips from 10-50mm. Can also be used to fit clutch springs.